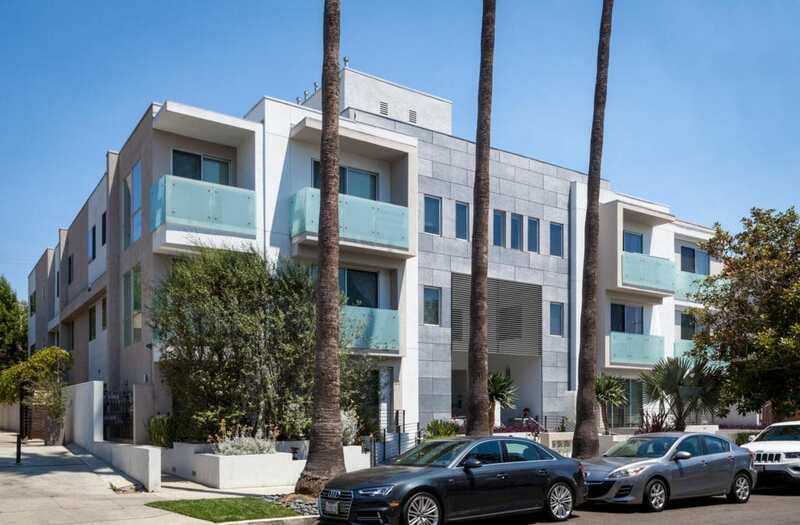 928 N Croft Ave is a 12-unit newer construction modern condo building in the West Hollywood adjacent neighborhood of Beverly Center. 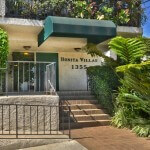 Built in 2007, by Developer Marc Guetta – these condos have high-end finishes and Big SQFT. 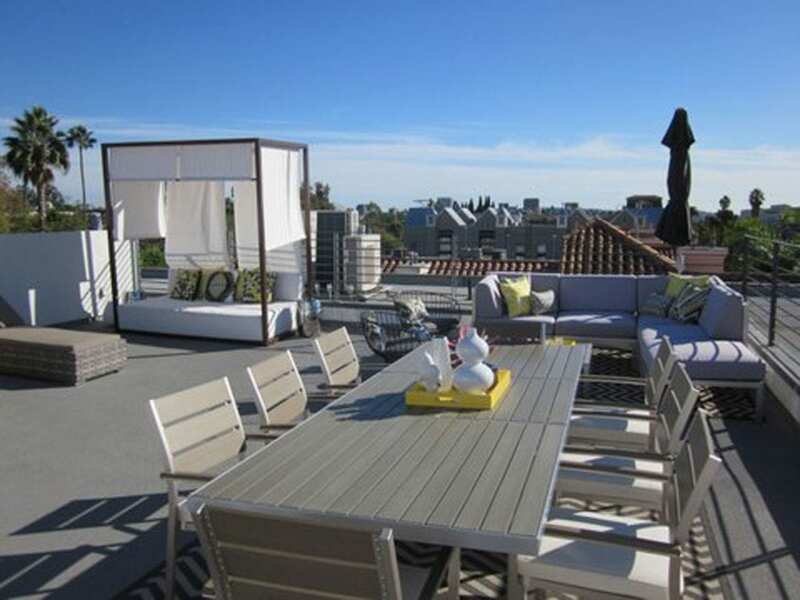 The Building has low HOA dues because it doesn’t offer a ton of amenities, just a nice rooftop deck. 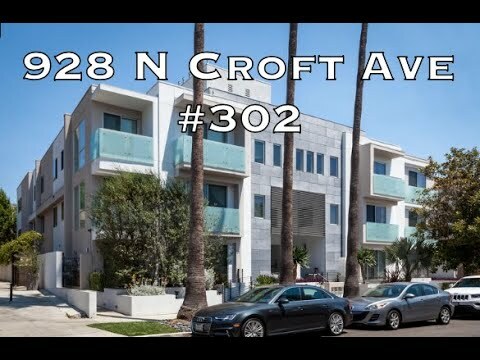 One of the things I love about 928 N Croft is the location right between Santa Monica Blvd. and Melrose Place. I don’t know why, but this building has a Santa Monica Vibe to it. I think the builder did an amazing job on the Landscaping. There is a lot of Slate tiling on the main walkway and in balconies, and sand glass. Light is good because they put in big windows. 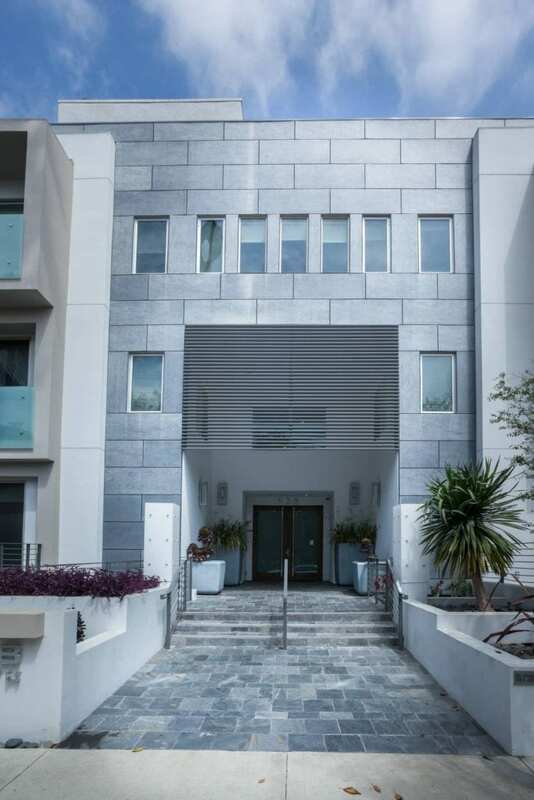 10 out of the 12 floor plans are single story, and two are townhouse style. The two first floor units in the back are townhouse style (#102 and #103). The building has a mix of 1,2, and 3 Bedroom floorplans. 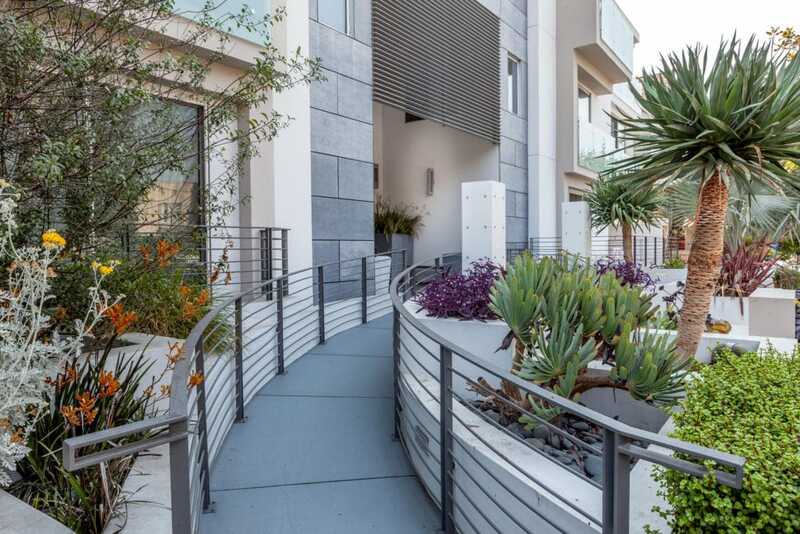 One thing I like about these condos is the “beefy” balconies, with slate tile flooring and sand glass and stainless steel railings. You can have a BBQ out there, or plenty of space for a table and 2 chairs. Some of the condos on 2nd and 3rd floor have views. The finishes in these condos standout- Custom Italian cabinetry by Bontempi, Cesaerstone counters, Bosch appliances. Bisazza tiles for the backsplash and bathrooms. Elica range hoods, under cabinet lighting, soft close doors, Deep soaking tubs by Zuma. Slate balcony floors. Walnut hardwood floors throughout living areas, Berber carpet in bedrooms (don’t love the berber). The master bathroom tile flooring oddly doesn’t match because it is neutral browns and the building color scheme is neutral greys. Mitsubishi Ductless HVAC, Lutron lightning dimming systems, Security video and intercom Siedle. Smart floorplans, with open square kitchens to large combined living room and dining room. The living rooms have an attached balcony. Every bedroom has a bathroom. which condos face the street and the rear? 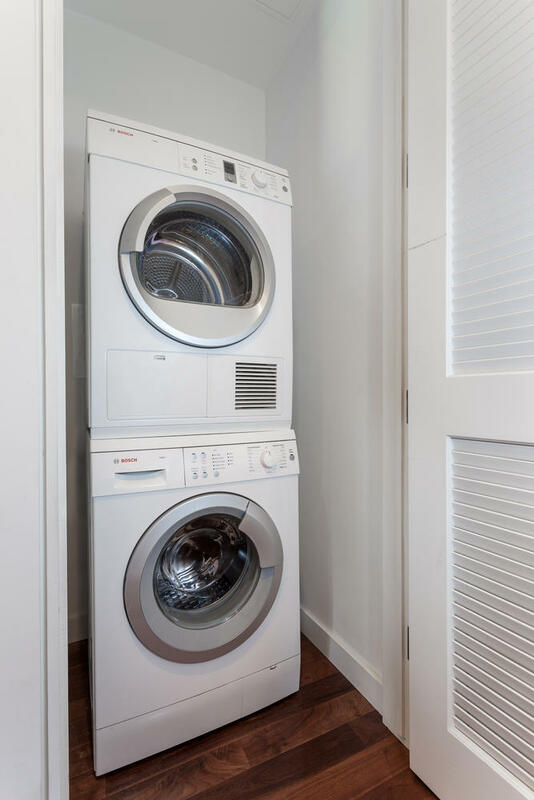 Laundry is inside each unit in a stacked washer dryer. Bosch is original equipment. 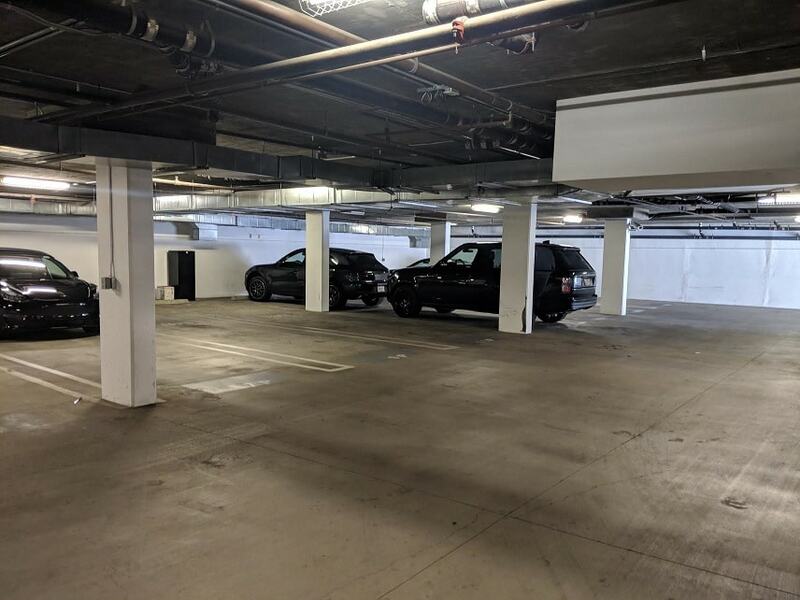 Each condo gets 2 parking spaces in the gated subterranean garage. Most of the parking spaces are Tandem, but there are a few side by side parking spaces. Sorry, no extra storage in Garage. There are 2 Guest Parking spaces. HOA dues Monthly Cost? $400-$500/mo.